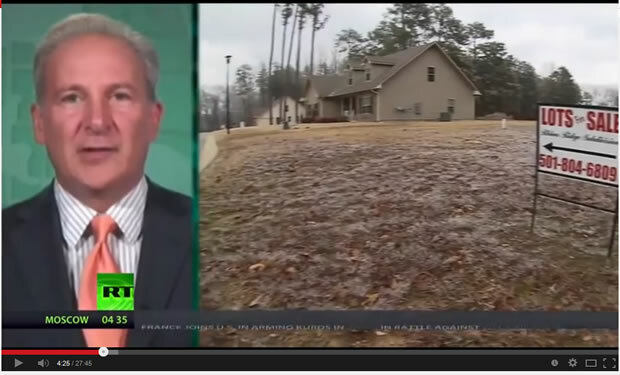 Peter Schiff recently made another appearance on RT News, once more warning that the U.S. Housing market is a bubble primed to burst as speculator investors will be forced to sell into a market without any buyers. "I think this is a bubble. I think speculative buyers are leaving the market ands there is no one to fill the void because the real buyers are absent and if you look at the recent home statistics the percentage of homes bought by first time buyers is at a record low and in fact home ownership amongst individuals is at generational lows so prices have to come down dramatically from here before real buyers can actually afford to buy all the properties that have been bought by speculators, and at some point the speculators if they cannot collect enough rent to cover the cost of ownership they are going to be selling these properties, and look out below because when they put these properties up for sale, again there are no buyers anywhere near the current prices." However the problem is that this is just the latest in a near continuous stream of bearish US housing market bubble imminent collapse mantra for the DURATION of this current 2 year+ bull market. For instance this is what Peter Schiff was warning of 18 months ago (April 2013). Of course the real risks in housing center on the next leg down, in what I believe will be a continuation of the real estate crash. We can’t afford to artificially support the market indefinitely. When significantly higher interest rates eventually arrive, the fragile market will again be impacted. We saw that movie about five years ago. Do we really want to see it again? The bottom line is that the global central banks ar engaged in an inflation war as they competitively debase their currencies via unprecedented money printing to INFLATE asset prices which are LEVERAGED to inflation, this was true for the stock market in 2009 (as I wrote at the time) and is true today for housing markets as the fractional reserve banking system ensures that whatever the central banks print will be leveraged up by at least X10 and during the mania phase as much as by X90 which will be driving the next subprime mortgage market that will once more ramp up prices into the final euphoria phase, which means a LOT of inflation is yet to come, far beyond anything that the academic economists that populate the mainstream press can ever conceive of, as from what I see they are still obsessed with non existant deflation whilst the housing bull market juggernaut rumbles on as illustrated by one of the most popular housing market articles of recent days as published by Forbes magazine. Meanwhile the smart money continues to pile into the US housing market as they snap up bargains (they have been doing so since at least mid 2012) whilst academics and mainstream journalists / salesmen, perma bears at blogosfear sites such as Zero Hedge, and off course cry babies who perpetually sit on the side lines always too fearful to commit, will as usual be found out to be wrong! Because they will NEVER understand what drives markets for the fundamental fact that they don't tend to put their own money on the line. Instead, I have put my own money where my mouth is and have committed 60% of my assets to the UK housing market on the basis of detailed analysis, just as I committed 30% to the stock market during 2009 because there is nothing that focuses ones mind to get it right than actually having a large chunk of ones wealth at risk. The latest U.S. house prices data released for May 2014 (185.3) shows that U.S. house prices are gradually converging towards trend forecast as I stated they would in January 2014, with prices now standing at forecast +5.3% (May data) deviation against +7.4% in January (Oct 13 data). U.S. House prices momentum continues to slow from a peak of +13.9% for November 2013 data to now stand at +9.2% for May 2014 data which as I warned before has mistakenly prompted many to conclude that the U.S. housing bull market could be over when all that is taking place is that U.S. house prices are oscillating around a trend of 10% per annum, and as I indicated in January 2014, that I expected U.S. house price inflation to slow to UNDER 7% before the end of this year. Furthermore US house price inflation looks set to continue to slow and could even slow to reach a trough of as low as 4% per annum house price inflation which whilst playing into the hands of the doom merchants, however in terms of the 3 year forecast will be of little significance. Despite mainstream media persistent noise for an increasingly negative outlook for US house prices for a multitude of reasons, the perception of which will be backed up by a sharp drop in US house price inflation to as low as +4%, instead the reality is for US house prices just oscillating around the central trend forecast of 10% per annum as today's +5% resolves to -4% by the end of this year (2014). Whilst the long-term trend trajectory remains in tact for a rise of over 30% by early 2016. Therefore I see no reason to undertake a more in-depth analysis at this point in time by delving into the fundamentals of the U.S. housing market such as looking at mortgage applications, housing starts, existing and new home sales data as I had been preparing to do, as the price has answered all of my questions in first trending towards convergence and then an under oscillation against my trend forecast that will sow the seeds for the next surge higher during 2015, thus U.S. home owners can look forward to at least another 18 months of a rising trend in house prices that I am sure will be accompanied by much gloom and doom commentary by clueless academics and salesmen, that I suspect will continue all the way towards NEW ALL TIME HIGHS for average U.S. house prices in a couple of years or so, which I am sure will trigger much end of the bull market double top commentary. The bottom line is that the likes of Peter Schiff will be calling the end of the housing market bubble ALL THE WAY TO NEW ALL TIME HIGHS!